Another eggless recipe from the Coombs Family Farms' website. They are also holding a contest for grilling recipes involving maple syrup. Not completely sure how many veggie recipes there would be for this category, but the prize is a "big basket of maple gifts." 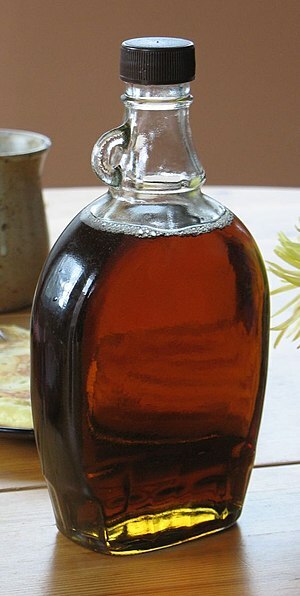 In a small pot, combine maple syrup and water. Without stirring, heat over medium high heat until syrup boils and turns to a dark brown. Remove from heat and stir in butter and cream. Be careful as the syrup may be hot and may splatter with the addition of the butter and cream. Pour mixture into an 8-inch cake pan. In a medium bowl, combine sugar, butter, and apples. Place apples in heavy baking pan, over syrup mixture. Place puff pastry circle on top of apples; prick with fork. Bake for 25 minutes or until apples are tender. Remove from oven and carefully remove puff pastry. Set puff pastry aside. Put baking pan (with apple mixture) over medium heat and simmer until the juices have completely evaporated. Watch constantly so it doesn’t scorch. Put puff pastry back on top of apples and flip pan onto large round platter. Remove pan. Slice and serve warm with a scoop of vanilla ice cream.